The Irish Minister for Diaspora Affairs, Mr. Jimmy Dennihan, TD, recently launched the Local Diaspora Toolkit (Irish Times article about the launch). It was created by the Clinton Institute at University College Dublin and is meant to be a "a practical guide for local authorities and local and community groups to assist in the development of strategies for local diaspora engagement." This toolkit was promised in the Global Irish – Ireland’s Diaspora Policy publication, which was launched earlier this year in March (I wrote a lengthy opinion piece when that document was published about the role of genealogy in diaspora engagement). The Local Diaspora Toolkit is divided into four main sections in relation to the diaspora - identifying, engaging, communicating, and growing, with a fifth section focusing on funding and investing. Users of the toolkit are first recommended to define their diaspora. Of the five diaspora groups identified—lived, ancestral, next generation, returning, and affinity—genealogy can play a fundamental role with the ancestral group. The toolkit encourages users to identify clusters of Irish emigrant communities, noting that "local knowledge, supported and enhanced by research, shows that there are often distinctive patterns of emigrant movement and resettlement from a specific area, so that you can find clusters of communities which have significant populations from a particular area in Ireland." Four examples are identified: Mayo's connections with Cleveland, Ohio; Monaghan's twinning with Prince Edward Island; the descendants of Longford emigrants in Argentina; and Ballyoura, County Cork's links with Peterborough in Canada. Regular readers of Townland of Origin will be familiar with my efforts to highlight these links. Researching those in the area of the U.S. or Canada where you immigrant ancestor settled in one useful strategy if you cannot find out where your ancestor came from in Ireland. The idea of researching links between a part of Ireland and another part of the world that were created due to emigration from Ireland is not new. However, it is encouraging to see it officially promoted in an Irish Government publication. There are very few countries in the world where genealogy forms part of official national Government policy. While that is an extremely positive step, these efforts must continue and be refined further. Projects in parts of Ireland that aim to connect with diaspora communities through genealogy and local history research can be beneficial in a number of ways. Bringing local residents together to work on a project creates social cohesion and community participation. Such projects can raise the profile of that community in the wider region through local media interest in any books or websites that showcase the research. Funding can be secured for the research which will be spent in the local community and county. Lastly, members of the diaspora will hopefully want to come and visits once the hard work has paid off and links are established. Many Irish communities in the U.S and Canada are keenly aware of such links and it has to be said that they have often been the driver in establishing such relationships over the last number of decades. It is good to see that, belatedly, these connections have been more readily recognized in Ireland over the last number of years. There is funding available through the Emigrant Support Programme for organizations outside of Ireland who are interesting in connecting with Irish communities (the application process for 2015 grant money is now closed). So if you want to start a diaspora project in your local community how can you get started? Access the Local Diaspora Toolkit here and get reading. The final section of the toolkit outlines a number of organizations that can help with project funding, such as The Western Development Commission, The LEADER Rural Development Programme, The Heritage Council and Worldwide Ireland Funds. Hopefully, increased funding will be forthcoming from these organizations for such diaspora research projects. Kennedy and Lyes. 2015. p. 15. Crowd-sourced, online transcription and indexing projects have become popular in genealogy over the last few years. Both Ancestry.com, through their World Archives Project, and Familysearch Indexing ask people to volunteer their time to transcribe and index genealogy records. The New York Public Library recently launched a transcription project called Emigrant City. Developed in collaboration by two departments of the public library (NYPL Labs and the Irma and Paul Milstein Division of United States History, Local History and Genealogy), "Emigrant City invites you to help transcribe recently digitized mortgage and bond record books from the Library’s collection of Emigrant Savings Bank records." The Emigrant Industrial Savings Bank, based in New York City, was founded by the Irish Emigrant Society and opened its doors in 1850. It was originally located on Chambers St., beside the current Municipal Archives, a location ideally suited to attracting a large number of Irish depositors who lived in Lower Manhattan. In all over 170,000 accounts were opened between 1850 and 1883 with the vast majority in the names of Irish men and women. The 6,400 mortgage and bond books that are to be transcribed date from between 1851 and 1921. Inevitably, there will be a healthy number of bank customers in the books who were Irish-born or the American-born children of Irish immigrant parents. In fact, the second person who received a loan from the bank was New York-born Mary O'Connor. She received a $2,000 loan on 22 January 1855. This is a project to keep an eye on, especially if you have New York City Irish ancestry. You can read more about the Emigrant City project on the dedicated NYPL website. Armstong, William. Emigrant City: An Introduction. 4 November 2015. New York Public Library. 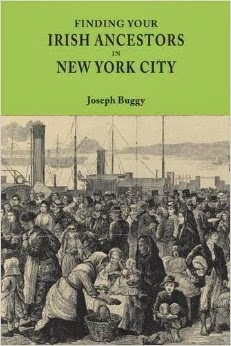 http://www.nypl.org/blog/2015/11/04/emigrant-city: accessed 7 November 2015. Sutton, Philip. Emigrant City: Two Stories. 4 November 2015. New York Public Library. http://www.nypl.org/blog/2015/11/04/emigrant-city-two-stories: accessed 7 November 2015.